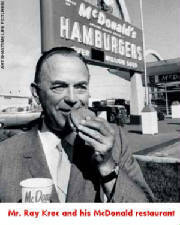 Mr. Ray Kroc was born on 5th October, 1902 in Oak Park. Ray Albert Kroc did not have the diploma of high school, so during World War I, he served as an ambulance driver like his fellow Oak Parker. Then, after he tried to do myriad things, he began to work in the Lily Tulip Cup Company to sell paper cups. Seventeen years later, he had become sales manager for the Middle West in this company. In 1941, Mr. Kroc became the exclusive sales agent for a machine that could prepare five milkshakes at a time. In 1954, Mr. Kroc realized that one of his largest customers Richard and Maurice McDonald owned a fast-food emporium in San Bernardino, California. After that Mr. Kroc considered to open franchise outlets patterned on their restaurant, which sold hamburgers, fries and milkshakes in quite low prices. In 1955, after the communication with the McDonald brothers, he paid them a small percentage of the gross of his operation and opened his first restaurant in Des Plaines, another Chicago suburb. Within a year, in California, Mr. Kroc opened the second and third restaurants because of the excellent business of the first one. In five years, there were 228 restaurants belonging to Mr. Kroc, and in 1961 he bought out the McDonald brothers. By the year of 1965, McDonald's would boast more than 700 sites. Mr. Kroc met his wife, Joan in 1956 and they were married in 1968. Joan found Operation Cork in 1976 which was financed by McDonald's revenues through the Kroc Foundation. Operation Cork was a national program to help the families of alcoholics. Mr. Kroc died of a heart ailment at Scripps Memorial Hospital in San Diego on January 14th, 1984. He had been senior chairman of McDonald's at his death. After Mr. Kroc opened his own restaurants, he learned that franchising should under the control of corporate headquarters, because without direct supervision, the franchises disobeyed Kroc's rules of uniformity and went their own way. As McDonalds’ system was successful, in Mr. Kroc’s opinion, he did not need to re-invent the existing rules by the McDonald, just copying the model. Mr. Kroc said that “When something works and is proven, you have a big head start.” These rules of the McDonald's system that the franchisees had to follow could ensure the business on good process. The first operating manual included food-preparation instructions and cleaning procedures in details. And it offered “detailed information ranging from the amount of onions to be used on a hamburger (a quarter ounce) to the correct temperature of hot chocolate (170 degrees Fahrenheit).” In addition, Mr. Kroc also followed one of the rules of the McDonald brothers- he did not hire women servers in order to avoid that they might attract high school boys. (Anonymous, 2005) Mr. Kroc’s restaurant had almost the same operating systems as the McDonald bothers’ one. In the beginning of establishing the new restaurants, Mr. Kroc should spend time on the more important things, so copying the existing model was the best choice.